My card uses the following SU products - dsp, cardstock and stamps. Other products used are plastic tree buttons, snowflake brad and a snow marker. Fantastic Christmas card! Thanks so much for sharing your wonderful talent with us at Papertake Weekly, and we hope you join us again soon! 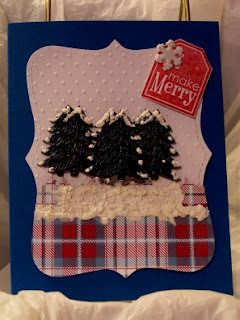 I really like this card...what have you used to do the snow on the trees and the ground? It looks fab! Hampers, I used a Marvy (Uchida) Snow Marker.